This lecture is designed to give you a general overview of how igneous rocks are related to tectonic setting. In this course, we will not consider in detail the origin of the various rock types and volcanic rock types will be emphasized over plutonic rock types, mainly because the tectonic setting is usually more clear in recent volcanic environments. The main characteristics of rocks that occur in the various environments will be discussed. The meaning of these characteristics and the clues that they give us to to origin of the original magmas will be left to the petrology course next semester. Because basaltic magmas of one type or another occur in nearly all tectonic environments, we will start with a general discussion of the types of basalts. On a chemical basis, basalts can be classified into three broad groups based on the degree of silica saturation. This is best seen by first casting the analyses into molecular CIPW norms (the same thing as CIPW norms except the results are converted to mole % rather than weight %). On this basis, most basalts consist predominantly of the normative minerals - Olivine, Clinopyroxene, Plagioclase, and Quartz or Nepheline. 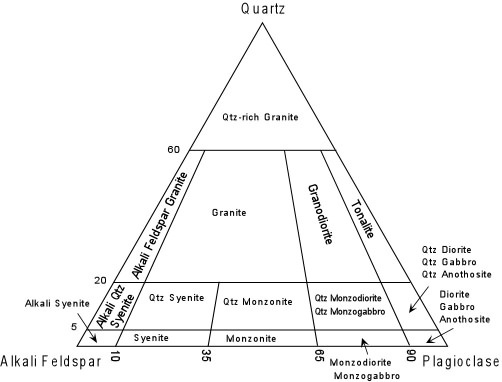 These minerals are in the 4 component normative system Ol-Ne-Cpx-Qtz, shown here as a tetrahedron. In the tetrahedron, plagioclase plots between Ne and Qtz, and Opx plots between Ol and Qtz. The basalt tetrahedron can be divided into three compositional volumes, separated by planes. The plane Cpx-Plag-Opx is the critical plane of silica saturation. Compositions that contain Qtz in their norms plot in the volume Cpx-Plag- Opx-Qtz, and would be considered silica oversaturated. Basalts that plot in this volume are called Quartz Tholeiites. The plane Ol - Plag - Cpx is the critical plane of silica undersaturation. Normative compositions in the volume between the critical planes of silica undersaturation and silica saturation are silica saturated compositions (the volume Ol - Plag - Cpx - Opx). Silica saturated basalts are called Olivine Tholeiites. Normative compositions that contain no Qtz or Opx, but contain Ne are silica undersaturated (the volume Ne-Plag-Cpx-Ol). Alkali Basalts, Basanites, Nephelinites, and other silica undersaturated compositions lie in the silica undersaturated volume. Note that tholeiitic basalts are basalts that show a reaction relationship of olivine to liquid which produces a low-Ca pyroxene like pigeonite or Opx. Both olivine tholeiites and quartz tholeiites would show such a relationship and would eventually precipitate either Opx or pigeonite. The critical plane of silica undersaturation appears to be a thermal divide at low pressure. This means that compositions on either side of the plane cannot produce liquids on the other side of the plane by crystal fractionation. The ocean basins cover the largest area of the Earth's surface. Because of plate tectonics, however, most oceanic lithosphere eventually is subducted. Thus the only existing oceanic lithosphere is younger than about Jurassic in age and occurs at locations farthest from the oceanic spreading centers. Except in areas where magmatism is intense enough to build volcanic structures above sea level, most of the oceanic magmatism is difficult to access. Samples of rocks can be obtained from drilling, dredging, and expeditions of small submarines to the ocean floor. Numerous samples have been recovered and studied using these methods. Most of the magmatism is basaltic. Still, few drilling expeditions have penetrated through the sediment cover and into the oceanic lithosphere. Nevertheless, we have a fairly good understanding of the structure of the oceanic lithosphere from seismic studies and ophiolites. Here we will first look at ophiolites, then discuss basaltic magmatism in general, and then discuss the various oceanic environments where magmatic activity has occurred. An ophiolite is a sequence of rocks that appears to represent a section through oceanic crust. Ophiolites occur in areas where obduction (the opposite of subduction) has pushed a section of oceanic lithosphere onto continental crust. During this process, most ophiolite sequences have been highly deformed and hydrothermally altered. Nevertheless, it is often possible to look through the deformation and alteration and learn something about the structure of oceanic lithosphere. An idealized ophiolite sequence shows an upper layer consisting of deep sea sediments (limestones, cherts, and shales), overlying a layer of pillow basalts. Pillow basalts have a structure consisting of overlapping pillow-shaped pods of basalt. Such pillow structure is typical of lavas erupted under water. The pillow basalts overly a layer consisting of numerous dikes, some of which were feeder dikes for the overlying basalts. Beneath the sheeted dike complex are gabbros that likely represent the magma chambers for the basalts. The upper gabbros are massive while the lower gabbros show layering that might have resulted from crystal settling. At the base of the layered gabbros there is a sharp increase in the density of the rocks, and the composition changes to ultramafic rocks. 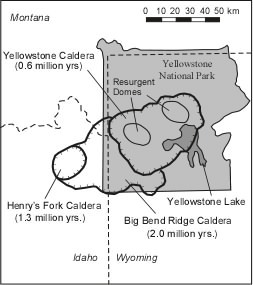 This sharp change in density is correlated with what would be expected at the base of the crust, and is thus referred to as the petrologic moho. At the top of the ultramafic sequence the rock type is harzburgite (Ol + Opx), a rock type expected to be the residual left from partially melting peridotite. The base of the ultramafic layer is composed of peridotite. Because most ophiolites have been hydrothermally altered, most of the mafic rocks have been altered to serpentinite. Note that ophiolite means "snake rock". The Oceanic Ridges are probably the largest producers of magma on Earth. Yet, much of this magmatism goes unnoticed because, with the exception of Iceland, it all takes place below the oceans. This magmatism is responsible for producing oceanic crust at divergent plate boundaries. Magma is both erupted and intruded near the central depressions that form the oceanic ridges. Thus, both basalts and gabbros are produced. But, little is known of the gabbros since they are rarely exposed and most oceanic lithosphere eventually is subducted. The main melting mechanism is likely decompression melting as rising convection cells move upward through the mantle beneath the ridges. At most oceanic ridges the basalts that are erupted are tholeiitic basalts sometimes referred to as NMORBs (normal MORBs). At Iceland, the rate of magma production is so high that volcanism has built the oceanic ridge above sea level. Most of the active volcanism occurs within two central rift zones that cut across the island. Again, the predominant type of basalts erupted are tholeiitic basalts, however, these are somewhat different from NMORBs, showing higher concentrations of incompatible trace elements. Thus, they are often referred to as Enriched MORBs (EMORBs). Unlike normal oceanic ridges, a significant volume of rhyolite is also erupted in Iceland. This was once thought to suggest that continental crust underlies Iceland, but it is more likely that the rhyolites are produced by either crystal fractionation of the basalts or partial melting of the oceanic crust beneath Iceland. Small volumes of alkali basalt have also erupted in Iceland. This alkaline volcanism occurs on top of the tholeiitic basalts and erupts in areas to the east and west of the main rift zones that cut across the island. At the oceanic ridges, the basalts erupted range in composition from Olivine tholeiites to Quartz tholeiites. The compositions are by and large restricted to basalt, i.e. less than about 52% SiO2. The diagram shown here is called an AFM diagram. It is a triangular variation diagram that plots total alkalies at the A corner, total iron at the F corner, and MgO at the M corner. As shown, MORBs show a restricted range of compositions that fall along a linear trend extending away from the compositions of Mg-rich pyroxenes and olivines. This is the trend that would be expected from fractional crystallization involving the removal of early crystallizing olivines and pyroxenes from a tholeiitic basaltic liquid. Note that the trend is often referred to as an Fe-enrichment trend. The rock suite erupted at Iceland shows a much broader range of chemical compositions. While EMORBs predominate, intermediate rocks like icelandites and siliceous rocks like rhyolites also occur. Plotted on an AFM diagram, we see that the EMORBs show a range of compositions that likely result from crystal fractionation of early crystallizing Mg-rich olivines and pyroxenes. With continued fractionation, the liquids follow an Fe enrichment trend to produce the Icelandites. During this sequence the olivines and pyroxenes are expected to become more Fe enriched which would tend to cause the trend to bend somewhat. But at the peak of Fe enrichment it appears that the liquids have become so rich in Fe that an Fe-rich phase, like magnetite, joins the early crystallizing mineral assemblage. Fractionation of this Fe-rich mineral assemblage would then cause Fe to become depleted in successive liquids, driving the liquid compositions toward rhyolite. Thus, crystal fractionation appears to be responsible for the main variety of rocks found at Iceland. The oceanic islands are, in general, islands that do not occur along the divergent or convergent plate boundaries in the ocean basins. Nevertheless, EMORBs, such as those that occur in Iceland, as well as the Alkalic basalts of Iceland have much in common with magmas erupted in the oceanic islands. In the Atlantic Ocean, which is a slow-spreading oceanic basin, as well as in the Galapagos Islands of the eastern Pacific Ocean, some of the islands occur close to oceanic ridge spreading centers. In all cases we must keep in mind that the parts of these islands that are accessible for sampling represent only a fraction of the mass of the volcanic structures which rise from the ocean floor at depths up to 10,000 m. Thus, as with the ocean ridge volcanic rocks, there is a potential sampling problem. Most oceanic islands appear to be related to ascending plumes of hot mantle. These plumes must be relative narrow features because they appear to operate independent of the main convection cells that ascend beneath the oceanic ridges and descend at subduction zones. Still, in places like Iceland on the ocean ridge, magma production rates are high, and compositions of rocks are similar to those found in oceanic islands. So Iceland could also be considered an oceanic island. If these rising plumes of hot mantle remain stationary in their positions in the mantle, they produce hot spots, as discussed previously. Hot spots are most recognizable when they occur beneath plates that move with higher velocities. Beneath faster moving plates, like the Pacific Plate, this results in linear chains of islands. At the position directly over the hotspot, rising mantle melts to produce magma that erupts on the seafloor, eventually building a volcanic island directly over the hot spot. As the lithospheric plate moves over the hot spot the volcano eventually is cut off from its source of magma, and becomes extinct, and a new volcano forms on the plate at the location directly above the hot spot. The volcanoes that have moved away from the hot spot eventually begin to erode until their elevations are reduced below sea level. At this point they are called seamounts. Such linear chains of islands and sea mounts are most evident in the Pacific ocean. The largest of these is the Hawaiian - Emperor chain. The hot spot that produced this chain is currently located under the position of the big island of Hawaii, which has the only currently active volcanoes in the chain. The bend in the Hawaiian-Emperor chain must have resulted from a change in the direction of plate motion. Volcanic rocks dredged from the sea floor at the location of this bend are about 40 million years old. Thus, prior to 40 million years ago the Pacific Plate was moving in a more northerly direction. The most northerly seamount is dated at about 60 million years. Seamounts older than 60 million have apparently been subducted. The reason such island/seamount chains are not as evident in the other oceans is because the plate velocity is lower and volcanoes tend to remain over the hot spots for longer periods of time, building elongated groups of islands rather than linear chains. Unlike the ocean ridges, which have a rather limited range of rock compositions, the oceanic islands have produced a broader range. Basalts are still predominant, but other compositions are part of the series, and the types of rocks produced are variable from one island to the next. The table below shows that variety of rock types found at different oceanic islands. Some produce tholeiitic rocks similar to EMORBs and others produce alkalic basalts that are saturated to undersaturated with respect to silica. Major Elements. For those islands that produce tholeiitic basalts, the range of compositions is similar to those that occur in Iceland. The more alkaline suites show a somewhat different range of rock types. Shown here is the more common alkaline suite produced at oceanic islands. The most basic rocks are alkaline basalts that show a range of compositions and an Fe-enrichment trend that likely results from fractionation of Mg-rich olivines and pyroxenes. As these magmas become more enriched in iron, hawaiites are produced. The fractionating assemblage then becomes more Fe-rich, likely caused by the addition of magnetite to the crystallizing assemblage. This causes an Fe-depletion trend causing magmas to evolve to mugearites, benmoreites or trachytes, and eventually rhyolites and/or peralkaline rhyolites. Perhaps not typical of all oceanic islands, but certainly the most well studied oceanic islands are the Hawaiian Islands. The main portion of each of the islands exposes tholeiitic basalts which appear to make up the most volume. At the northwestern end of the island chain is the island of Kauai. Tholeiitic volcanism built Kauai about 5.5 million years ago. As one moves to southeast along the chain the age of tholeiitic volcanism becomes younger, occurring at 3.8 and 2.8 million years ago on Oahu, 2 and 1.7 million years ago on Molokai, and 1.3 and 0.9 million years ago on Maui. The big island, Hawaii, is composed of 5 major volcanoes. The oldest is Kohala whose tholeiitic shield was built about 800,000 years ago. Hualalai and Mauna Kea are somewhat younger, and Mauna Loa and Kilauea are still actively erupting tholeiitic lavas. Although the lower parts of Mauna Kea, on the big island, and Haleakala on Maui are composed of tholeiitic basalts, they are capped by steeper sided composite cones that consist of alkali basalts, hawaiites, mugearites, and trachytes. These alkaline caps are thought to have existed on top of the tholeiitic shields that make up the older islands, but the alkaline rocks have been eroded. The island of Oahu is deeply eroded, but recent volcanism has occurred on the eroded shield. This post-erosional volcanism, as it is called, consists of highly alkaline basanites and nephelinites. In terms of total alkalies and silica the three suites of rocks each show trends of increasing alkalies with increasing SiO2. In basic magmas the alkaline elements K and Na behave as incompatible elements, so crystallization of Mg & Fe- rich phases tends to cause both SiO2 and alkalies to increase. Thus the general trends are consistent with crystal fractionation as a mechanism to explain chemical variation in each suite. The least siliceous rocks of each suite show a trend of decreasing alkalies with increasing SiO2. Again, because the alkali elements are incompatible in mantle mineral assemblages this could be explained by increasing degrees of partial melting. But, in the Hawaiian Islands, the tholeiitic magmas are produced first. During the tholeiitic stage the volcanoes are located directly over the rising mantle plume the forms the hotspot. In this area we might expect higher mantle temperatures and thus higher degrees of melting to produce tholeiitic magmas. As the island moves away from a position directly over the hotspot the temperatures in the underlying mantle would be lower, but the rising plume at the hot spot could still drive the somewhat cooler mantle upward. Because the temperatures are lower, lower degrees of partial melting would be expected, and the slightly more alkaline magmas would be produced and erupt to form the alkalic caps such as seen at Mauna Kea and Haleakala. Finally, after the passage of several million years the volcano has moved farther away from a position above the hotspot, and thus temperatures are even lower. Melting of the mantle at this lower temperature would result in lower degrees of melting to produce the very alkali-rich basanite magmas. If this is the case we might expect a symmetrical distribution of magma types being produced on both sides of the hotspot. The difference, of course, would be that volcanism on the plate before it has reached the hotspot would only occur on the seafloor, because the volcanic island will not yet have been built. The only evidence presently available to support this idea is that just to the southeast of the big island there is currently an active submarine volcano called Loihi seamount. Chemical compositions of lavas erupted from Loihi are alkali basalt. In recent years more light has been shed on the possible origin of the calc-alkaline suite. Perhaps the best evidence comes from experimental petrology and recent advances in experimental techniques. First, however, consider experiments conducted at low pressure on tholeiitic basalt magmas. These experiments show that at low pressure Plagioclase and Olivine crystallize first, with proportion of plagioclase crystallizing being higher than that of olivine. 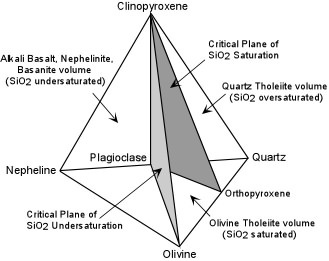 On the projected phase diagram, removal of Olivine and Plagioclase drives the liquid composition away from the Olivine corner until it intersects the the Ol + Plag + Cpx + Liq. cotectic. 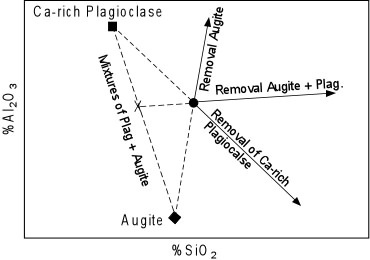 Further crystallization of these phases will then drive the liquid composition along the cotectic to eventually crystallize pigeonite (low Ca-pyroxene) as shown by the light colored path on the diagram. A wide variety of igneous rocks occur in the continental lithosphere, a reflection of its heterogeneous nature compared to oceanic lithosphere. In addition, because the continents are not subducted and are subject to uplift and erosion, older plutonic rocks are both preserved and accessible to study. We start with granitic rocks and their associated pegmatites, next consider large volume continental rhyolites and basalts, and finish with continental rift valleys. Here we discuss a group of plutonic igneous rocks usually referred to as "granitic rocks", "granitoids", or loosely as "granites". Included are true granites, but our discussion will include all medium to coarse-grained rocks that are mostly felsic with a few mafic minerals. A variety of classification schemes have been proposed for granitic rocks. The easiest to employ uses the modal mineralogy of the rocks, while others attempt classification on the basis of the tectonic setting, or type of source rock which melted to produce the granitic magma. The feldspathoid bearing rocks include the feldspathoidal syenites, which will not be considered to any large extent here. They are considered anorogenic granites because they are generally found in areas that have not undergone mountain building events. Instead, they appear to be related to continental rifting events wherein continental lithosphere is thinned as a result of upwelling asthenosphere. The upwelling raises the geothermal gradient resulting in melting. Young peralkaline granites are found in the Basin & Range Province of the western U.S., and older examples are found throughout southeastern Australia. Although each flood basalt province differs somewhat in the composition of magmas erupted, most provinces have erupted tholeiitic basalts. With the exception of a few early erupted picrites in some provinces, the tholeiitic basalts tend to have lower concentrations of MgO (5 - 8%) than would be expected from melts that have come directly from the mantle without having suffered crystal fractionation. Thus, despite their large volume, they are differentiated magmas that are similar in many respects to MORBs. Thus removal of Ca-rich plagioclase will result in depletion of Al and enrichment of Na and K (as well as Si). This is termed the "plagioclase effect". (Recall that peralkaline rocks are those that have a molecular amount of Na2O + K2O > Al2O3). On the other hand, if a ferromagnesium phase with high Ca, but little Al, such as augite, also fractionates, then Al depletion will be minimized with increasing Si, thus offsetting the plagioclase effect to produce normal metaluminous rhyolites.